The Shift – Many are navigating the reality that ministry is never sustainable without money (lots of it, I might add). We are accustomed to offerings and foundations, but the “new” is self-sustaining ministries that carry an integral wealth creation component. Our lives and ministries need to be grown like a business. One shift that is happening is that God’s people want experiences, not just information. 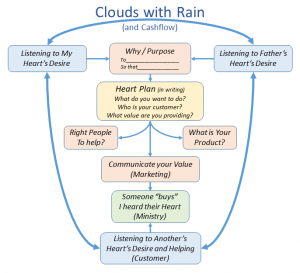 If my “message” doesn’t include a means to follow-up to gain more value, then I don’t have a message that’s going anywhere (clouds without rain). If what I have adds value to others, they are more than happy to “buy it,” and new wealth is created in the process. They are changed and implement new approaches in their lives. We are no longer just teaching truth and being good examples. As a leader, I’m engaging in what the Father is doing – Reformation and changing nations. We are not abandoning churches or preaching. We are pointing to another Kingdom dimension (I admit sometimes it feels like a parallel universe for many of us!) We are examples of living from cups that overflow, and we are embracing a kingdom anointing to create value for others and we’re calling it ministry. We are ministering out of wisdom and revelation so we not only teach truth, but we are examples of practical results (products people want, marketing that works, and cash flow that multiplies). Trading has always been part of the Kingdom and money has always been a medium to exchange value that enriches others. We all have bills to pay and providing value for other people is the practical side of ministry that creates wealth. The dividing line between spiritual ministry and practical ministry is gone. The practical side of providing value for customers is a primary avenue of spiritual ministry. It’s a fiscally sustainable model. Many are being invited by God into the business of Kingdom right now. Revelation and wisdom are two wings of the same airplane. We are both practical and spiritual; prophetic and profitable. There is an entrepreneurial door of creativity open in the Spirit right now to produce value and take new initiatives. In this Kingdom model of ministry, I’m am listening to the Father’s heart, but I’m also in touch with what he’s written in my own heart. I’m integral with my own heart – genuine, a quality people pick up on and appreciate. The ability to be in touch with my own heart’s desires is what enables me to pick up on the desires of other people that I minister to (we call them customers). They can tell we’re picking up on their hearts and it feels like being loved! I have opened my book (Ps 139:15-16), and I don’t just have a plan to fulfill my destiny. I have a product, a team to help me, and a marketing strategy to get the word out. People “buy” what I have because I’m in touch with their hearts and I’ve created something they (and God} are excited about! The Online Heart Plan – We’ve been coaching people to connect with what God wrote in their hearts for eight years. We leave them in a place of pursuing the dreams that ignite their zeal for life. It has led to some remarkable career transitions and business startups. To make this process more accessible, it’s now in an online course format that you can access now. It starts on March 29. Thank you John. May all He has for you continue to flow in and through you.